This simple, industrial serving tray is made from natural fir wood with a light natural finish. Rounded handles, made from aged metal are forged on with exposed hardware. 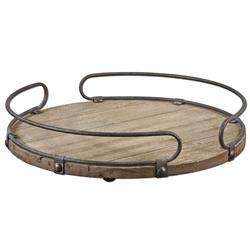 This circular tray will be a perennial favorite, serving up lemonade, hot cocoa and everything in between.